Floyd Rose gained popularity in the 1980s through many of rock's influential guitarists making the Floyd Rose their weapon of choice. Eddie Van Halen took the electric guitar to new heights and was one of the very first to use a Floyd Rose. Other premiere guitarists who realized early on that the Floyd Rose had the unique ability to stay in tune, even with extreme changes in pitch, to invent new guitar licks included: Joe Satriani, Steve Vai, Neal Schon, Brad Gillis, Dweezil Zappa, Richie Sambora and Mick Mars. 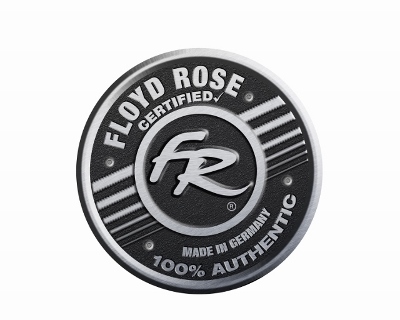 Floyd Rose has continued to maintain the quality and strict standards discerning guitarists have come to expect. Innovation also continues to be a hallmark of Floyd Rose. By 2011, thirty-four years later, products by Floyd Rose have evolved to become industry standards. The offering is broader than ever-- ranging from the Floyd Rose Original to the Titanium Floyd Rose! Floyd Rose tremolos are found everywhere in the world and offered by virtually every guitar company on the planet. Floyd Rose... the pursuit of innovation and perfection.